A Graded Collection of Piano Duets by Master Composers. Edited by Gayle Kowalchyk, E. L. Lancaster, and Jane Magrath. Duet or Duo; Graded Standard Repertoire; Masterworks; Piano Duet (1 Piano, 4 Hands); Solo Small Ensembles. 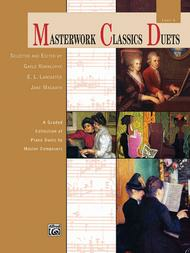 Alfred Masterwork Edition: Masterwork Classics Duets. Masterwork. Book. 64 pages. Alfred Music #00-41276. Published by Alfred Music (AP.41276). These graded collections of piano duets by master composers are among the best literature available at respective levels. Each duet, written by composers who lived in the 18th, 19th, and 20th century, has been carefully edited and fingered for performance ease. Titles: Rondo (Turk) * The Storm (Turk) * Polonaise (Turk) * Rondino, Op. 149, No. 17 (from Melodious Pieces) (Diabelli) * Sonatina in C Major (Weber) * Waltz and Trio No. 5 (from Six Waltzes with Trios) (Pixis) * Waltz and Trio No. 5 (Moscheles) * March in C Major, Op. 18, No. 1 (Gade) * Russian Dance, Op. 74, No. 7 (from 10 Pieces pour cinq touches) (Cui) * Trojky (from Moravian Dances) (Janacek) * Waltz, Op. 34, No. 4 (from Six Children's Pieces) (Arensky) * Fugue on a Russian Theme, Op. 34, No. 6 (from Six Children's Pieces) (Arensky) * Am See (Poldini) * Pavane de la belle au bois dormant (from Ma mere l'oye) (Ravel). "Am See," "March in C Major," and "The Storm" are Federation Festivals 2016-2020 selections.